Let’s just get this out of the way right up front. America’s oldest gun maker, which recently celebrated its 200th anniversary, has taken its share of licks in the past several years. Lawsuits, ownership woes, questionable management decisions and a bankruptcy. Now with new ownership in place, the firm begins another chapter. 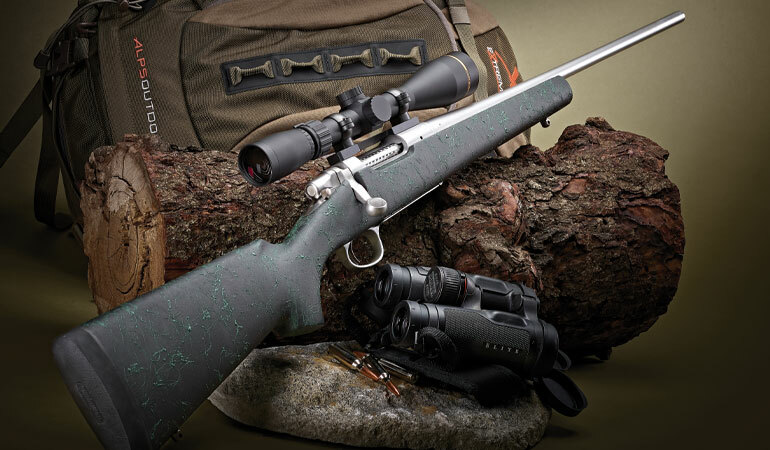 If the new Model Seven SS HS is any indication, Remington has taken a great step forward as it looks to the future. Introduced in 1983, the Model Seven is the smaller, lighter little brother to the Model 700. In recent times the company didn’t seem to pay a lot of attention to this svelte, handy rifle—focusing more attention on the Model 700 line and the Model 783 budget rifles. But that lack of attention has ended with the Model Seven SS HS. The Model Seven was initially introduced with an 18.5-inch barrel in several short-action calibers. The Model Seven SS HS is also chambered for short-action rounds—.243, 6.5 Creedmoor, 7mm-08 and .308 Win.—but its stainless steel barrel (the “SS” in the name) is a 20-incher like most of its current stablemates. I’ll discuss the barrel in greater detail in a bit because you probably want to know where the “HS” comes from. The stock is made by HS Precision, one of the best stock makers in the country. The stock on the Seven SS HS is a looker, for sure: black with spruce-green spiderwebbing. I’m a sucker for spiderweb stocks, and this one not only looks nice but also feels really good in your hands. The dimensions are unremarkable, for lack of a better word. Some stocks feature a large wrist, which I can get used to, or a thin wrist, which I can tolerate. This one is Goldilocks-just-right. Similarly, the fore-end doesn’t get tricky—no beavertails, finger grooves or other adornments because it doesn’t need them. The hand-laminated Kevlar/fiberglass/carbon-fiber construction has a slightly rough texture for a sure grip, and the green spiderwebbing adds more texture. HS also injects polyurethane foam into the stock, which deadens the noise less-expensive synthetic stocks can make when they bang into things. The stock features a CNC-machined bedding block, and initially the barreled action was free-floated. But early on, Remington designers weren’t seeing the accuracy they had hoped for, so they added a 1.5-inch pressure pad two inches back from the fore-end tip. This provides additional stability for the barrel, taming excessive whip. The Model Seven is the short-action version of the M700. It’s a trim, accurate and super-handy rifle with all the functional benefits of its bigger brother. The barreled action is attached to the stock with screws of different thicknesses and socket sizes. Remington senior rifle product manager Eric Lundgren told me this is because the smaller receiver of the Model Seven required designers to make some changes from the Model 700, and the result was less material in the tang area between the rear screw and the trigger housing. That was especially true with the wood stock the Seven initially came with, and the smaller rear screw gave it more “meat” there, he said. While designers had to make some tweaks to create the Model Seven action, they didn’t mess with success, and the Seven action retains the twin-lug bolt of the 700. The wear on the lugs on my sample indicates both are bearing equally, as they’re supposed to. The Model Seven incorporates the same safety used on the Model 700. It’s a simple two-position rocker. Maybe it’s because it’s the safety I’m used to—as a guy who owns more 700s than any other action, by a large margin—but I definitely prefer it over other styles. If you want to open the bolt for any reason, you don’t have to mess with the safety or any other button or latch to accomplish that. Here’s where some will cry, “But what if the bolt catches on something and opens while I’m in the field?” I’ve never had this problem, and I’ve had to bull through some pretty nasty stuff over the years. The X-Mark Pro adjustable found on the Model Seven SS HS is not a world-class trigger, but it is a big improvement over previous Remington triggers. The pull on my sample averaged four pounds, six ounces with no creep or overtravel. Rupp’s Nebraska deer hunt convinced him the Model Seven SS HS is not merely a capable hunting rifle but rather a superb all-around gun suitable for just about any task. I didn’t have the right L-shaped Allen wrench to adjust it before I took it hunting, so I left it as it was and didn’t feel handicapped—especially since I wore gloves the entire hunt and wouldn’t have wanted it a whole lot lighter. I also experienced no problems breaking good shots during bench testing. Once the hunt was over and I was able to disassemble the gun without worrying about losing zero, I did adjust it down to three pounds, 12 ounces before the screw stuck out more than I cared for. Mark Sidelinger, Remington’s senior vice president of marketing at the time, cited this adjustment screw as a frequent customer comment. And I get it. I don’t want a screw protruding from the finger lever of my trigger either. But like I said, it was okay as it was before I adjusted it. 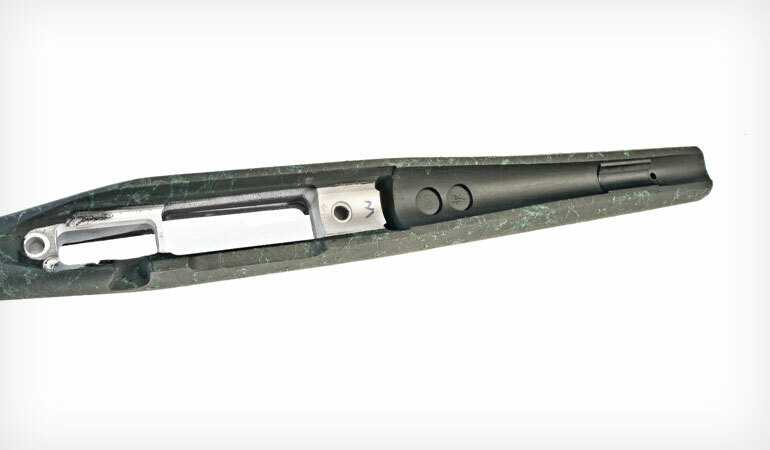 The rifle feeds from an internal box magazine and features a hinged floorplate—as the good Lord intended. Yeah, yeah, everybody’s going to detachable box magazines these days, but I’d rather drop a floorplate and let rounds fall into my hand, pocketing them for later. I don’t want a big ol’ loaded magazine banging around in my pocket, and of much greater importance to a scatter-brained person like myself, with a hinged floorplate I don’t have to fret about forgetting or misplacing a detachable magazine. Okay, let’s talk about the barrel. As mentioned, it’s 20 inches long, tapering from 1.2 inches in front of the sandwich-style recoil lug to 0.57 inch at the muzzle. I like that the barrel is neither a stubby tub nor a whippy snake. The Model Seven SS HS takes part of its name from the HS Precision stock. 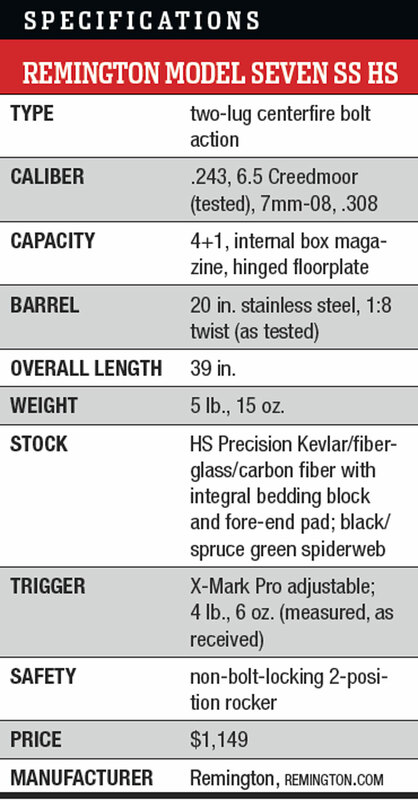 It’s a good-looking, well-proportioned stock with an integral aluminum bedding block and a pressure pad out front for more stability. That’s the exterior view. 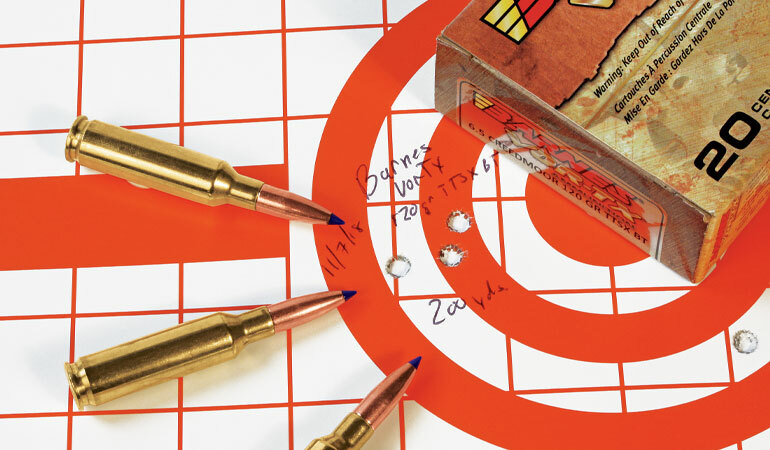 When I first received the rifle, which is chambered in 6.5 Creedmoor, I rushed it to the range to get a rough zero in preparation for a later accuracy-testing session. The first two groups with the hunting load they sent me, Barnes’ Vor-TX 120-grain TTSX (Remington owns Barnes, in case you didn’t know), ran about 1.75 inches at 100 yards. This was not great. As soon as I got home, I cleaned the rifle with my favorite Bore Tech copper solvent. After one go-round, I ran a Hawkeye borescope through the barrel and was greeted with a fair bit of copper fouling remaining. So I cleaned it again, this time much more thoroughly, and got most of it out. Back at the range a couple days later, the rifle shot really well, as you can see in the accompanying chart, but this particular barrel is prone to copper fouling. Its interior doesn’t have the smoothest finish you’ll ever see. There are some minor machining marks and rough spots, and these are going to be stripping copper from bullet jackets, which can hinder accuracy. However, when kept clean this rifle shoots great on average and is occasionally outstanding. In addition to my 100-yard testing, I also shot a few good groups at 200 yards—including a 0.7-inch cluster. The minor bore imperfections notwithstanding, this is what you can achieve when you have a well-built short action coupled with good stock and a short barrel that doesn’t whip around. The rifle weighs an ounce under six pounds bare, and with Leupold’s Freedom 4-12X scope aboard, mounted in a one-piece Leupold steel base and steel rings, it tips the scales at seven pounds, one ounce. Remington’s efforts with the new Model Seven have really paid off, creating a handy rifle with excellent accuracy potential—as this 200-yard group attests. Sidelinger told me one of Remington’s targets with the Seven SS HS is smaller-statured hunters, such as women and youngsters. Oh, and also me. Now I know why he invited me to go hunting with him and shipped me the Seven SS HS to use. At 5-6, I definitely fall into the small-stature category (as long as you don’t look at my waistline). The weight and balance on this rifle are indeed ideal for smaller people, and as for the fast-growing women’s market, I think it will appeal aesthetically to women who want a rifle that looks like many of us think a rifle should—not something in pink or other non-traditional color. 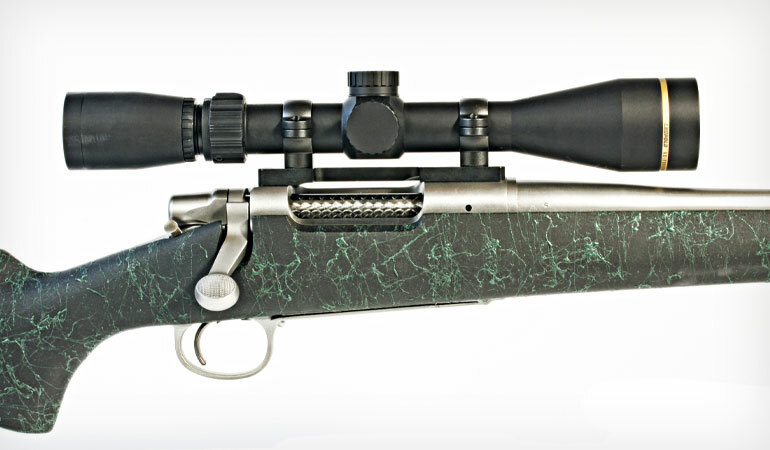 The danger in talking about who a particular rifle is suited for is that it can paint said rifle into a corner, and this is the last thing I want to do because I think the Seven SS HS is one gun that can basically do it all for any hunter—newbie or grizzled vet, man, woman or youngster. On my Nebraska hunt with Goose Creek Outfitters (GooseCreekOutfitters.com), I spent the first couple days watching woodlot edges from a box blind. If you’ve hunted out of a box blind, you know how difficult it can be to maneuver a rifle into position. Long barrels bang into the walls at inopportune times, and heavy guns can be difficult to bring to bear quickly. The Model Seven SS HS was a dream to work with in close confines. I had it set up on my Bog Pod several times in anticipation of a shot, and the rifle’s balance made it rest solidly and provided a super-steady hold. When outfitter Scott Fink later took me on a sneak through a cedar thicket, I was glad I had a rifle with a 20-inch barrel instead of the longer tube I usually carry. My chance came on the third day after a short stalk brought us to within 150 yards of a bedded mule deer buck. I initially tried to use the Bog Pod and shoot from kneeling, but the position put me dangerously close to clipping a fence wire. So instead I stood and rested my elbows on the hood of a derelict truck we were using for cover, the deer being bedded near an old, abandoned homestead. The buck was angled slightly away, and the first shot hit him mid-rib—the 120-grain Barnes shredding his heart and exiting the neck. He stood and took a couple of steps, at which point I put one in the back of the ribs. It traveled through the vitals and broke the buck’s far shoulder. Okay, so I didn’t tote the rifle over hill and dale, but I did carry it enough to appreciate the light weight. I’m closing in on 60, and to be honest, even a midweight rifle is starting to bother my shoulder on hikes of any length. So the rifle went two for two on this trip: great in a blind, great to carry. What else would it be good for? Its light weight would make it an excellent mountain rifle, as long as the velocity loss from the short barrel isn’t going to be a problem for you. Ditto plains outings for deer and antelope. No, it’s not a “long range” rifle, but it has plenty of accuracy to make hits out to 300 yards. And I’m not worrying one bit about velocity loss because I think this rifle would really shine as a woods gun. Light, easy to maneuver in thick cover and with plenty of power in any of the caliber options. Tree stand hunting? You bet. I avoid tree stands like the plague, but I’ve done it enough to know that having a short, light rifle makes life so much easier. When you consider the available chamberings, you’re looking at a rig that can tackle any big game in North America save brown and polar bears. At the risk of inducing 6.5 Creedmoor fatigue, I do think this is perhaps the ideal caliber option because of the cartridge’s capabilities coupled with its light recoil. It’s not that it would be unmanageable in 7mm-08 or .308—far from it—but any time I can shoot a lighter-recoiling rifle, that’s the route I take. And I have nothing against the .243, which would be equally easy on the shoulder and just as effective on most game. I just have more experience with the 6.5 Creedmoor and prefer it. As I watch more and more rifles being built with battleship-size barrels, colossal stocks and chambered to cartridges that burn gunpowder by the bushel basket, it’s good to see there’s still room for a sensible, do-it-all rifle—a constant companion you can turn to in all but the most specialized situations. That’s what this gun is, and I can’t think of higher praise for a hunting rifle.